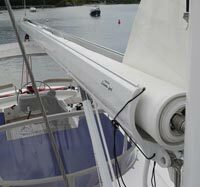 Whether rigged on monohull or multihull, Leisure Furl™ delivers simplicity and ease of use, and unmatched reliability proven on all types of boats, and hundreds of thousands of nautical miles. Engineered specifically for your boat, Leisure Furl™ offers eight unique models and a multi-factor design program that assures your system will be exactly right for your boat. Available in aluminum or carbon fiber, each boom can be customized with a variety of finishes and power systems. Mike Dwight February 18, 2016 Category: Forespar Products in Use. Tagged: furling, in-boom furling, main sail, mainsail, roller furling.